News from LMCU: LMCU Has Come To Lowell! LMCU Has Come To Lowell! LMCU Is Popping Up All Over! It’s been a very busy few months, and not just in Lowell, MI. We also officially opened up new branch locations in Saginaw and White Lake, MI, as well as Fort Myers, FL with grand opening and ribbon cutting events for all. While many banks and credit unions have been shutting down branch facilities, LMCU has been actively expanding its brick and mortar presence. Sure, a lot of people use online and mobile app banking, but there will always be a need for face-to-face interaction. 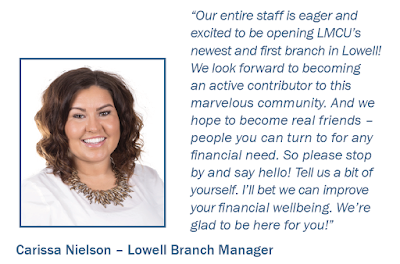 These new branches are a demonstration of LMCU’s tangible commitment to the communities we serve. If you live or work in Saginaw, White Lake or Fort Myers, stop by sometime and let’s get acquainted!